Earlier this month, I had the pleasure of attending the Tastefully Simple Party Palooza; which is a four-day conference and unveiling of the new fall products for Tastefully Simple consultants. 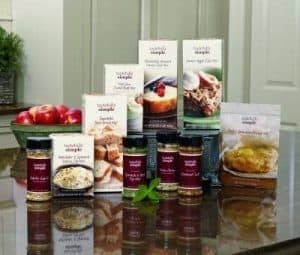 If you’re not familiar with the company, Tastefully Simple is a direct sales company which offers women and men a home-based business opportunity in the gourmet food industry. Not having any prior experience with Tastefully Simple, I was excited to find out more about them, as well as sample some of their tasty treats! Tastefully Simple was founded by Jill Blashack Strahan back in 1995 … here’s how it all got started. After graduating from Alexandria Technical College with an associate’s degree in sales and marketing, Jill managed a small town restaurant. After a few years, she started her own business of selling gift baskets. During this time she decided to sell samples of gourmet food items from her gift baskets at a local crafter’s tour, which dramatically increased her sales. Jill realized the power of taste-testing and hence, Tastefully Simple was born. Since its inception in 1995, Tastefully Simple has grown to be a $100 million-plus enterprise with thousands of consultants nationwide. Upon entering the main hall where the Party Palooza was being held, I could tell that the Tastefully Simple Consultants not only loved what they do, but they had a serious passion for the products that they were selling. It was seriously like a rock concert, with lights, music and yes, dancing! After some pre-party festivities, Jill Blashack Strahan took the stage and pumped up the audience some more with inspirational words and wisdom. Then all of the new fall products were revealed during a huge taste-testing segment – all I can say is yum! So How Does Tastefully Simple Compare to Other Direct Sales Companies? Tastefully Simple sells gourmet, easy-to-prepare food products, from appetizers and desserts to seasonings, sauces, and specialty gift items. Their catalog includes over 60 simple and tasty food, that can be ready with two ingredients or less. On average, consultants sell $410 per party and earn 30% in commissions. The second way to earn money is by sponsoring others, which allows consultants to earn an additional percentage on team and personal sales. The Tastefully Simple Blast Off Kit includes everything consultants need to conduct their first four parties (catalogs, order forms, party food kits, samples, supplies, display products, and training material). The cost to get started is $170, and there is currently a special where consultants, in August or September can earn $85 cash back if they sell $500 by October 15th. Or if they sell $1,000 by October 15th they can receive $170 cash back, which makes the Blast Off Kit, free! Tastefully Simple consultants receive top-notch training, from personal one-on-one sessions with a sponsor to regular meetings with team members and comprehensive training materials, audios, and videos. And don’t forget the energy fueled conferences and regional events. Some other perks that Tastefully Simple Consultants receive are a 30% discount on products and the opportunity to earn free trips for achieving certain milestones. Tastefully Simple has an A+ rating with the Better Business Bureau and is a member of the Direct Selling Association. While I didn’t have the opportunity to sit down and personally talk with a consultant, the vibe that I got from the 1,300 consultants in attendance was one of complete adoration and excitement for what they are doing and for the company. The company has a great motto, simple. delicious. fun.™ and you can see this through every product they sell. While I got to try the majority of the new Fall-Winter line, some of my favorites were Tastefully Simple old standbys, like the Absolutely Almond Pound Cake Mix ™ and the all natural Seasoned Salt – which I’ve been using on everything from eggs to meats. The price point of the products ranges from $1.99 to $89.95, which is perfect for any budget. And because food is consumed daily – it is relatively easy for consultants to receive repeat business. Tastefully Simple’s commission rates (30%) are on par and slightly above other direct sales companies (industry average ranges from 20% – 35%). If you would like more information on this home-based business, please see TastefullySimple.com, or connect with them on Facebook, Twitter, Instagram or Pinterest. What Comes in the Tastefully Simple Business Blast Off Kit®? Tastefully Simple provided me with compensation, airfare, hotel, and products to review. All opinions I express are my own. For more information, please see my disclosure policy. Image courtesy of Tastefully Simple, Inc. Used with permission. I would like to become an agent. Could you please forward me the necessary forms and information. Tastefully Simple is a third-party company, so I don’t have their forms on hand. Hi Bev, Thanks for sharing your direct sales experience! Are you with Tastefully Simple? Good Collection Hanna ! excellent post….. Whole stuffs denoting to Work at home based have good income sources for peoples. its also reducing unemployment opting work at home based. I agree that their consultants are very passionate about what they do. I’m excited to learn more about the business side of things from your posts for them. Thanks for stopping by, Jen! It was great meeting you!